Review: This is a very good example of well-organized and detailed strategy map. The Goal is to increase long term shareholder values for stakeholders. 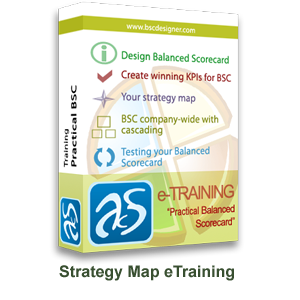 All the objectives have been properly categorized into base 4 balance scorecard format and the relationships among these objectives have also been explained over. 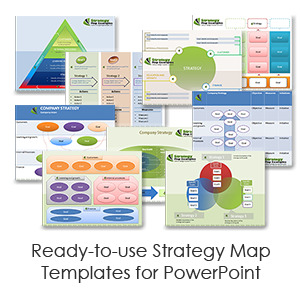 Internal process are further categorized which is an indication of a highly structured strategy map. Opportunities: Strategy map is very suitable for organizations following highly structured approach for strategy development. 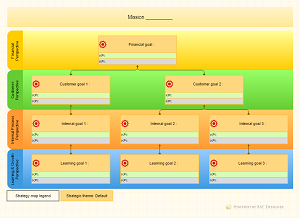 The managers who breakdown objectives into small goals can take benefit from this strategy map. This map is good for organization of all sizes from small to large organizations. Good for organizations having hard and fast standard operating procedures. Result: A very good strategy map with fine grained goals integrated together to achieve a common objective that is to increase shareholder values. Although every objective has been clearly explained, learning and growth objective lack details and are not well explained.